Moses, Part I - III. Auf, hervor aus euren Zelten - IV. Herr, Gott, du bist uns're Zuflucht für und für! Moses, Part II - IV. Hört des Heerhorns tosend Dröhnen - V. Stosset in die Halldrommeten! Conducted by Bruch, the debut performance was finally held on the 8th of January 1895 in Barmen. 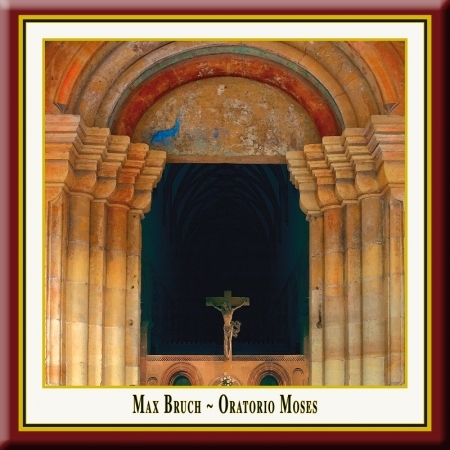 It is a piece of early oratorical art that Bruch has created here, yet one that is cloaked in the era of the Late Romantic. The choir is the decisive mediator of events in the piece of work. In addition to delicate poetic expression, the dramatic impact also demands particularly creative agility and adaptation from the singers. Even Bruch's contemporaries were suspicious of the opus. In June 1895, Johannes Brahms wrote to Clara Schumann: "Bruch has now published a Moses... If only one could feel a hint of joy in the stuff! They are weaker and worse than his own early works in every respect. The only good sentiment is when one feels inclined, as I do, to thank the Lord that he spared us of the sin, the vice, or the bad habit of mere score-writing." Bruch, on the other hand, saw himself affirmed in his work and wrote to his publisher Franz Simrock in February of 1895: I want to tell you a secret: noble and ample effects on thousands are not to be attained by common means; something higher, which cannot be defined, is working from within the productive artiste... I could have not have written Moses' had not a strong and deep feeling of divinity been alive in my soul, and every deeply insightful artiste will have experienced that once in his life, so that through the medium of his art, he can proclaim to the people the best and innermost emotions of his soul... And in such, Moses proved to the world that I did not stand still  as that is the most potent danger in older age." recorded, released & created by Andreas Otto Grimminger & Josef-Stefan Kindler. Peter Lika began his singing career as a soloist in the boys' choir Regensburger Domspatzen and is considered one of the leading bassists in the concert and opera circuit. Paired with a finely balanced, dramatic expressiveness, his unmistakable timbre makes him a predestined soloist for roles such as that of the prophet Moses. Conductors like Masur, Schreier, Rilling, Gardiner, Marriner, Norrington, Celibidache or Herreweghe appreciate working together with Lika, as do renowned international orchestras, not least due to his extensive repertoire and also his longstanding experience with early music. Performances with the Gewandhaus Orchestra of Leipzig, the Bamberger Symphonic, the Chicago Symphony Orchestra, the Israel Philharmonic Orchestra and nearly all German broadcast orchestras have led Lika to the major musical centres of Europe, Asia, and USA. Finally, song programmes are also part of Lika's repertoire; with Sawallisch, he has recorded Schubert's vocal epos among other things. Birgitte Christensen was born in 1972 in Norway. She concluded her vocal training in 1997 at the state conservatory in Oslo. In November 1998 she made her extremely successful debut at the Norwegian National Opera as the Queen of the Night and was distinguished with the prestigious Esso award for outstanding opera performances. Since December 1999 she has been engaged by the Innsbruck Theatre where she has sung the main role in Händel's Partenope, Liu in Turandot and the Queen of the Night. In June 2000, she received a grant for her part in Partenope and was awarded the Eberhard Wächter medal. Stefan Vinke was born in Osnabrück and studied song with the court singer Edda Moser in Cologne, and with Eugene Kohn. The accomplished church musician received his first engagement at the Karlsruhe State Theatre of Baden in 1993. He sang for two seasons here before switching to the Krefeld-Mönchengladbach Theatre. Jun Märkl engaged Stefan Vinke for the 1999/2000 season as the 1st youth heroic tenor at Mannheim's National Theatre. In the new Ring, Stefan Vinke sings the role of Siegmund, followed by Lohengrin, Parsifal, Florestan and Tristan. The orchestra was founded in 1990 by graduates of the St. Petersburg Rimsky-Korsakoff Conservatory. The tours with Mstislav Rostropovitch, Igor Oistrakh, Mikis Theodorakis, Nina Corti and Giora Feidman as well as with opera and ballet soloists of the Moscow Bolschoi Theatre and the St. Petersburg Mariinski Opera attracted international interest. Performances in the cities of Paris, Rome, Madrid, Amsterdam, London, Frankfurt, Munich and Leipzig as well as at various festivals testify of the orchestra's exceptional status. The Maulbronn Cantor Choir (German: Kontorei Maulbronn) is the large oratorio choir of the monastery in Maulbronn. The choir was founded in 1948 as a federation of the Evangelic Church Choir Maulbronn and the choir of the Evangelic Seminar Maulbronn. In this tradition the choir is formed today with ambitious choral singers from the region and students and former students of the Seminar Maulbronn (gymnasium with boarding school). Over those many years of its existence the choir has performed the complete repertoire of popular oratorios and worked together with orchestras like the 'Southwest-German-Radio-Symphony-Orchestra Baden-Baden and Freiburg', the 'Central German Chamber Orchestra', the 'Southwest German Chamber Orchestra Pforzheim' or the 'Baden Philharmonic Orchestra'. Soloists of these performances were artists like Barbara Schlick, Maya Boog, Sandra Moon, Sophie Daneman, Marga Schiml, Elisabeth von Magnus, Hans Peter Blochwitz, Aldo Baldin, Marc Clear, Markus Brutscher, Peter Lika, Gotthold Schwarz and Ludwig Güttler. The German television station ZDF broadcasted a portrait about the Choir, and the choir has participated in live radio recordings for the SDR, SWR, Deutsche Welle and Deutschlandfunk. Prof. Jürgen Budday (born 1948) is conductor, director of church music, music teacher and artistic director of the concert series at the UNESCO World Heritage Site Maulbronn Abbey. He started teached at the Evangelical Seminar in Maulbronn from 1979 till 2012. This also involved his taking over as artistic director of the Maulbronn Monastery Concerts and the cantor choir in 1979. He studied church music and musicology at the Academy of Music in Stuttgart from 1967 to 1974. In 1992, he was named Director of Studies, in 1995 came the appointment as Director of Church Music and in 1998 he was honored with the "Bundesverdienstkreuz" (German Cross of Merit) as well as the Bruno-Frey Prize from the State Academy in Ochsenhausen for his work in music education. In 1983 Jürgen Budday founded the Maulbronn Chamber Choir (Maulbronner Kammerchor) with whom he won numerous national and international awards. At the Prague International Choir Festival, for example, Jürgen Budday received an award as best director. Since 2002, he has also held the chair of the Choral Committee of the German Music Council and became director and jury chairman of the "German Choir Competition" (Deutscher Chorwettbewerb). In 2008, he received the silver Johannes-Brenz-Medal, the highest honoring of the Evangelical-Lutheran Church in Wuerttemberg. Jürgen Budday was honoured in 2011 with the honorary title "Professor". In May 2013 Prof. Jürgen Budday was awarded by the Association of German Concert Choirs with the "George-Frideric-Handel-Ring" - one of the highest honors for choir conductors in Germany. Thus Jürgen Budday followed Helmuth Rilling, who was honored with the ring from 2009 till 2013. Jürgen Budday has started a cycle of Handel oratorios that is planned to span several years, which involves working with soloists like wie Emma Kirkby, Miriam Allan, Michael Chance, Nancy Argenta, Mark Le Brocq, Charles Humphries, Stephen Varcoe (to name but a few). The live recordings of these performances, that have received the highest praise from reviewers, has won him international recognition. Till these days 11 oratorios by G.F.Handel are documented on discs. "No conductor and no choir have so consistently recorded so many Handel oratorios as Jürgen Budday and his Maulbronn Chamber Choir." (Dr. Karl Georg Berg, Handel Memoranda Halle 2008). IV. Canticle: Herr, Gott, du bist uns're Zuflucht für und für! 6. VIII. Recitative: Israel, schicke dich! 7. IX. Recitative: Abtrünnige, kam es dahin mit euch? 8. I. Glück zu, es gelang, o seliger Tag! 9. II. Recitative: Die ich entsandt', die Boten kehren heim! V. Recitative: Stosset in die Halldrommeten!